This mythical dragons list is dedicated to all of the dragons that we just could not dig up enough information or artwork on to dedicate an entire page to at this time. Dragons, well they are our favorites, so we are desperately trying to make our list the best out there. Even though we haven’t been able to find too many details yet, we still feel some of these creatures are fascinating enough to include in our favorite list. We always hope that through additional research we can find even more information and artwork on these captivating mythical creatures. We will keep updating individual dragons as we come across any additional information. We hope that one day; we will find enough interesting details and artwork to dedicate an entire page to some of these intriguing creatures. New artist on board - check out his awesome work! 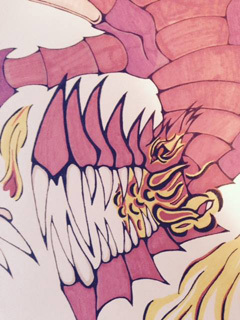 Who drew this Red Dragon? 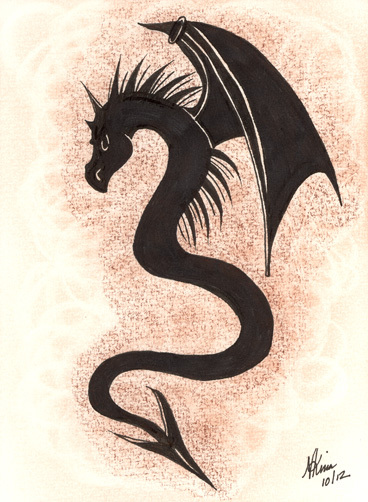 Amphithere - The Amphithere, Amphiptere or Amphitere is a type of legless dragon with bat-like wings. It is described as being covered with feathers or fur depending on the region where it is found. They usually have a devilish arrow tipped tail but their overall appearance can be a variety of different color combinations. Balaur - A balaur is a very large dragon with fins, feet and several serpent heads. It usually has three but is also described as having as many as twelve heads. The saliva of this European dragon is also said to form precious stones. Guivre - The Guivre was a huge serpent with the head of a horned dragon. It had super lethal breath that would kill crops and spread deadly plagues. Whenever it would emerge from the water, it would leave whatever it touched dead and diseased. The Guivre was finally defeated and expelled from France when it caught sight of a naked human. This traumatic experience drove the dragon away to the north, where humans tend to wear more clothing.